She was exhausted and heartbroken when people finally saved her. 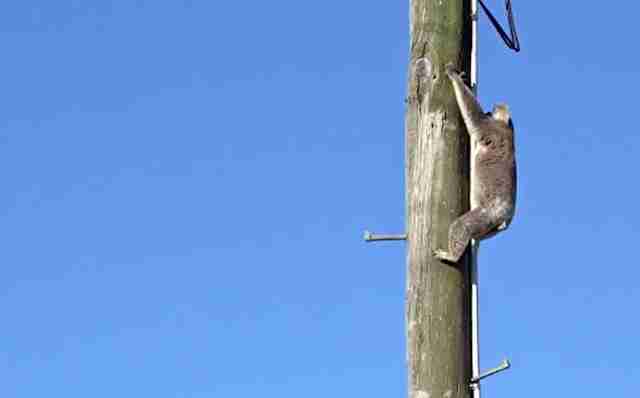 A wild koala is finally safe after spending two days clinging to a power pole in sweltering heat. The poor girl had climbed up the pole in the city of Toowoomba, in Queensland, Australia, probably thinking it was the trunk of a eucalyptus tree — then couldn't get down. She was stuck hovering above rushing traffic and barking dogs, probably terrified. Once the koala was spotted, Clare Gover, a wildlife rehabilitator and founder of Return to the Wild, and a crew of electricians with a cherry picker came to her rescue. 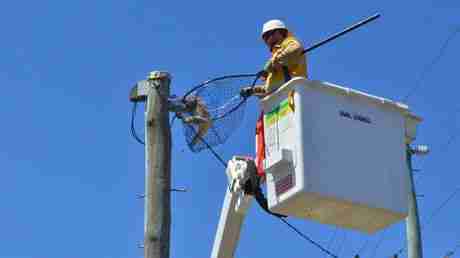 The crew managed to coax the scared animal off the pole and safely into a net. Gover found that the koala was dangerously dehydrated as well as very stressed. "We gave her fluids, a fresh leaf, and held her overnight for a rest," Gover told The Chronicle. "She started eating straight away." The next day, the wild koala seemed like herself again, and so she was released back into the forest — but the future of koalas in the region is uncertain because of habitat loss. This koala's plight highlights a major controversy going on in the region that pits the needs of these wild animals against people who want to cut down forests to develop the land. "There is a lot of development going on around Toowoomba," Gover said. "It is having an effect on koalas and other wildlife." And koalas are already having a harder time finding food sources because of increasingly extreme temperatures. Luckily, despite the many threats facing the lovable animals, many people are willing to stand up for koalas. "Right now, vital laws that would help protect koalas' homes are being considered," WWF Australia wrote, encouraging citizens to write to their representatives, speaking for those who can't. It's estimated that cutting down trees has killed more over 5,000 koalas in just four years, according to WWF. You can also help koalas in need by making a donation to Return to the Wild.